Allow me to introduce you to your new Travel Committee: Allysha, Fleur, Roel, Jasper, Evelien, and Lotus. Over the next few months, we will be brainstorming, planning and arranging what promises to be the best study trip yet. Although it cannot be said with 100% certainty yet, Scotland is scheduled for this year. 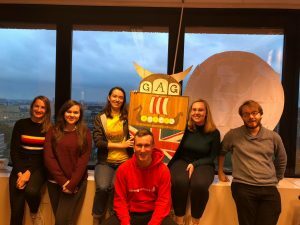 Yes, everyone, this year, G.A..G. will take you to the land of whisky, kilts, Irn Bru, haggis, Robert Burns, bagpipes, Sean Connery and mysterious lake monsters (will we spot them? Let’s hope so!). Now, we can imagine that you’re all extremely excited to hop on board the G.A.G. Express and to be swept away across the North Sea, but unfortunately this will have to wait for a few months, so keep the heid for a bit longer. Until that time, you can all hype yourselves up by attending the first Info Meeting, where we will tell you all about this year’s study trip and how to sign up. After that, off we go to Scotland! If you think “I have to go on this amazing, wonderful, fantastic and most of all unforgettable study trip”, make sure to become a member of G.A.G.! We hope to see all of you on the first Info Meeting, and of course in Scotland. We don’t know about you, but we’re all very excited!